SILENT VECTOR was a strategic level exercise designed to simulate possible U.S. reaction to a credible threat of terrorist attack when there is not sufficient information for effective protection. The overall purpose of the exercise was to assist the Administration and Congress in their attempts to improve the effectiveness of response during the pre attack phase of a major terrorist incident. The United States operates 103 nuclear power plants, is the world's largest consumer of petrochemicals and by-products and continues to import a disproportionate amount of oil from the Middle East. It is reasonable to assume that terrorist organizations have recognized the potential financial, industrial, and public impact of a substantive attack against American energy infrastructure. SILENT VECTOR challenged current and former senior government leaders to respond to increasingly credible and specific intelligence indicating the possibility of a large scale attack against critical energy and energy-related infrastructure on the East Coast of the United States. 1. Is the attack real? How credible is the intelligence? 2. What is likely to be attacked? 3. What should our priorities be? 4. Can anything be done to prevent an attack? Over the course of the two days leading up to the expected attack (simulated by two 4-hour sessions), role players were presented with specific analyses on threats, vulnerabilities and expected impacts as well as, emergent intelligence and law enforcement data to help formulate a comprehensive response plan. At the outset, the role players determined that the threat was too vague for direct, specific measures but did raise the alert level and installed general protective measures. This in turn led to media leaks and public panic in communities near energy facilities, such as nuclear power plants. The role players then had to face the problem of balancing rising panic with the need for more extreme protective measures. The day of the expected attack comes and goes, but nothing happens. 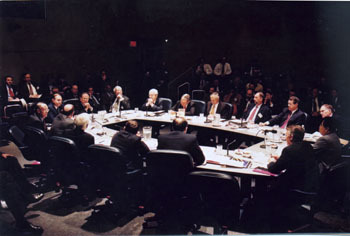 The role players must confront the silence of the day after the anticipated attack (simulated by one two-hour session). They are faced with not knowing if the attack was foiled, deterred, or a hoax. Role players must determine when it is safe to return to normal life. In developing the scenario for SILENT VECTOR, CSIS created a threat/vulnerability integration methodology to map likely terrorist capabilities against the vulnerabilities of specific sectors/facilities of energy and energy-related infrastructure. While simplified for the purposes of the exercise, the methodology used to develop a threat/vulnerability integration matrix establishes a foundation upon which to build a system of assigning priorities and allocating resources for homeland security. Currently, no such analytical approach exists for U.S. critical infrastructure. For more information about Silent Vector, contact Phil Anderson. Special thanks to Environmental Systems Research Institute and AIR Worldwide for their invaluable technical support in the planning and execution of Silent Vector. WASHINGTON, October 18, 2002 â€” - CSIS president and CEO John Hamre, CSIS Homeland Security Initiatives Director Phil Anderson, and ANSER Institute Director Randy Larsen, will outline the initial results of a recent simulation exercise of the pre-attack phase of a credible threat to the U.S. energy infrastructure from 12:00 P.M. 1:00 P.M. on Monday, Oct. 21, at CSIS, 1800 K Street, NW, B-1 conference level, room A. Silent Vector, which was patterned after the 2001 Dark Winter simulated bioterrorist attack, was designed to reveal some of the most pressing issues and vulnerabilities that would arise if the nation were faced with a highly credible, but ambiguous, threat of a terrorist attack on American soil. * What are the critical challenges the federal government would face during the pre-attack phase of a terrorist event focused on U.S. energy infrastructure? * What unique challenges would the law enforcement and intelligence communities face when responding to credible but ambiguous threats to the American homeland? * What are the fault lines that exist in the interagency community, and among federal, state and local governments during the pre-attack phase of a major terrorist incident? * What are the fault lines that exist between the public and private sectors during the pre-attack phase of a major terrorist incident? * What are the potential impacts of a credible threat of attack? * What are the key vulnerabilities of select critical energy infrastructure? "As with Dark Winter, we believe that a detailed discussion of this 'real world' energy infrastructure scenario and its effects will serve the nation's national security interests," said Anderson. "We expect that a well-planned and executed simulation focusing on the threat-rather than consequence management-of a major attack on U.S. energy infrastructure could generate a similar level of policy attention and impetus for improved preparation and response by the administration and Congress." Colonel Randall Larsen, USAF (Ret), is the Director of The Institute for Homeland Security and the National Security Advisor to the Center for Biosecurity, University of Pittsburgh Medical Center. He previously served as the Chairman of the Department of Military Strategy and Operations at the National War College, where in 1999 he created the nation's first graduate course in homeland security. Colonel Larsen began his studies of homeland security in 1994 while on a one-year fellowship at the University of Pittsburgh Graduate School of Public and International Affairs. Larsen was one of the first witnesses to testify before the 9-11 Commission, and since 9-11 he has served as an expert witness to the Senate Armed Services, Senate Judiciary, House Government Reform, House Homeland Security, and House Budget Committees. In March 2005, he designed and ran a two-day workshop and table top exercise for the House of Representatives Committee on Homeland Security. Additionally, he served on the 2003 Defense Science Board Summer Study on Homeland Security and is a member of the Council on Foreign Relations. His publications include: OUR OWN WORST ENEMY: Asking the Right Questions About Security to Protect You, Your Family, and America (Grand Central Publishing, September 2007), The Executive's Desk Book on Corporate Risks and Response for Homeland Security (The National Legal Center for the Public Interest, March 2003), and Defending the American Homeland 1993-2003 (Air University Press, December 2003). His op-eds have appeared in the Washington Post, Wall Street Journal, New York Post, and USA Today. Larsen has been the homeland security consultant/on-camera analyst to CBS News since March 2003, and he co-hosts the weekly, one-hour public radio show, Homeland Security: Inside and Out. He is also a frequent guest on radio and television including: CBS, NBC, ABC, CNN, BBC, NPR, Jim Lehrer News Hour, Fox News Channel, Larry King Live and Oprah. At the request of senior public and private sector leaders, he has designed and led numerous war games and table top exercises including: DARK WINTER (bioterrorism, 2001), SILENT VECTOR (critical infrastructure, 2002), CRIMSON SKY (agro-terrorism, 2002), CRIMSON WINTER (food security, 2003), TERMINAL RISK (environmental terrorism, 2003), ATLANTIC STORM (international public health, 2005), and OIL SHOCKWAVE (oil crisis, 2005). Colonel Larsen served in both the Army and Air Force for a combined total of 32 years of military service. He began his flying career as a 19-year old Cobra pilot in the 101st Airborne Division, where he flew 400 combat missions in Vietnam. He also served as military attachÃ© at the U.S. Embassy in Bangkok, the chief of legislative liaison at the U.S. Transportation Command, and the commander of America's fleet of VIP aircraft at Andrews AFB MD. His decorations include the Legion of Merit, Distinguished Flying Cross, Bronze Star, 17 awards of the Air Medal (3 with "V" Device for Valor), and the South Vietnamese Cross of Gallantry.